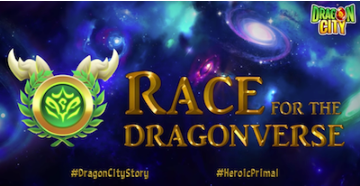 Race for the Dragonverse PART III - Heroic Race: let's save... YGGDRASIL! The very last part of the Race for the Dragonverse Event is here. Now that we have summoned all the FAE Dragons, including their Queen, the Evanescent Dragon, we are now facing the last challenge of this thrilling event… we need to save Yggdrasil! To do so, we will need to Race for him! On your marks, get set, and GOOOO Dragon Master! The last effort to save not just him, but the Dragonverse and Dragon City itself! Dates: It will run from Wednesday, July 25 until Monday, August 6. IMPORTANT: UPDATE YOUR GAME to v8.3.1! In order to enjoy all the Heroic Race Improvements, you need to update your game to the latest version (v8.3.1). Keep reading to find out all the improvements! :) Please notice that, If you don't, you will not have, for instance, the time limited Laps & Rewards; or the special FAE quests (NEW Missions type in Nodes) and instead, you will have different fight nodes. See all Lap rewards in-game! Certain Laps will trigger a countdown when they are reached. If you finish the lap within the time limit, your lap rewards will be multiplied! Some laps will give you x2, some will be x4… Check on the Lap rewards screen what laps will have the timer! NEW Missions in Nodes: QUEST! For this Heroic Race, we will have a new mission type which is a Quest battle. So, during your progress in the race, you will be able to complete temporary Quests (with and without requirements!) to fulfill the missions! So, thanks to your effort and commitment during the Race for the Dragonverse event, having the Fae Dragons will give you an advantage! ALSO, by completing the special FAE Quests, you will get Super Fae Chest which contains Orbs to EMPOWER your Fae Dragons! Yes! This special Heroic Race will also have a special kind of temporary collection. By having ALL THE FAE Dragons + Yggdrasil, you will obtain Orbs of Yggdrasil! And this is not all, Empowering all the Fae Dragons will give more Orbs of Yggdrasil. The more Fae Dragons you have empowered, the more Orbs of Yggdrasil you will receive. For example, for the ones who manage to obtain 3 stars of each Fae dragon -> will receive the Orbs to empower Yggdrasil TWICE! Get your Lap rewards after completing them! With the EXCEPTION of LAP 15 - Yggdrasil - NOW you won’t need to close and restart your game to received them! You will get the rewards right after completing them! ...and what about the Special Rewards? For this new race, we have added many more rewards! We will have REWARDS at the end of EVERY LAP! Check out the list of ALL the rewards you can get NOW! Reach LAP 2 and be rewarded: 20 Trickster FAE Orbs. Reach LAP 3 and be rewarded: 20 Seism FAE Orbs. Reach LAP 4 and be rewarded: 15 Gems. Reach LAP 5 and you will Qualify for the race prizes + 40 Very Rare Orbs. Reach LAP 6 and be rewarded: Food! Reach LAP 9 and be rewarded: 25 Crested FAE Orbs. 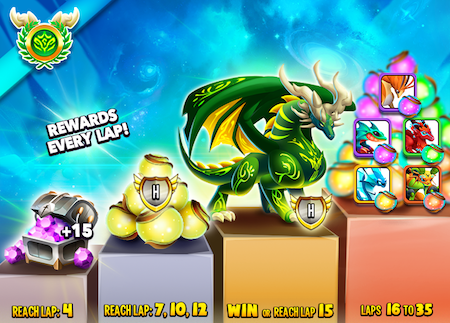 Reach LAP 15 and win a brand new Heroic Dragon, YGGDRASIL! Reach LAP 19 and be rewarded: Food! You can now check ALL LAP rewards in-game! Reach LAP 50 will be rewarded: Ultimate Chest!!!!! Tons of FOOD! 5 Million!! That's all for now, Dragon Master! It’s time Dragon Master, go and race until the end! An epic race to save Yggdrasil, the nature in the Dragonverse and the nature in our beloved Dragon City world! Happy racing everyone & see you on the islands!